Here is our second healthy eating and nutrition idea. This could work for breakfast, lunch, dinner, or just as a snack. Garlic, chilliflakes, salt, pepper and coconut oil. Heat your pan. Add the coconut oil when the pan is hot enough. Once the oil disperses, add the salmon pieces. Season the salmon, then add, as an option, dried chilli flakes and garlic. Wash and tear the kale into small pieces whle waiting, leave in the strainer. 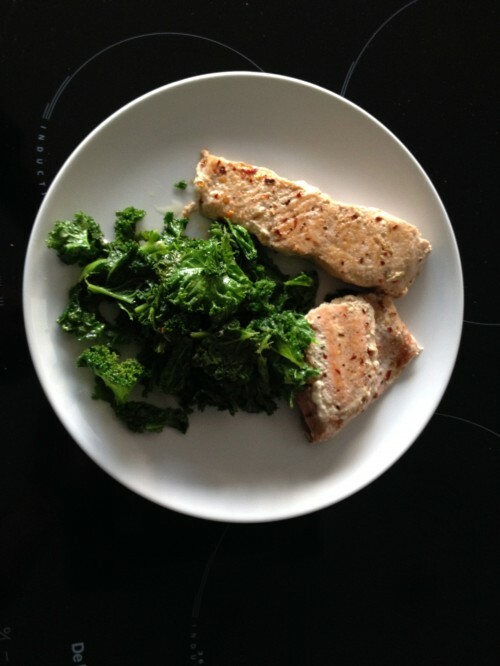 After a few minutes, turn the salmon pieces, then add the kale. Turn the salmon again after a few minutes and give them another couple of minutes both sides. Toss the kale around the pan. When the salmon has lost its pink colour, it's ready to eat.